Abortion rate decline: Guttmacher study vindicates birth control and pro-life education, not restrictions. Is it birth control or moral aversion? Maybe both. Some lessons for pro-lifers. Protesters participate in the annual March for Life rally in Washington, D.C., on Jan. 22, 2009. The abortion rate has fallen again. It’s at its lowest level since 1973, the year Roe v. Wade was handed down. What’s causing the decline? Should we be happy about it? Can we learn anything from it? shows that women are rejecting the idea of abortion as the answer to an unexpected pregnancy. This latest report from Guttmacher shows the long-term efforts of the right-to-life movement to educate the country about the humanity of the unborn child and to enact laws that help children and their mothers are having a tremendous impact. Pro-choicers don’t buy this spiel. They say the abortion rate is down thanks to contraception. Planned Parenthood points out that alongside the abortion decline, “births were also down,” demonstrating “the importance of affordable, accessible birth control.” Slate’s Amanda Marcotte agrees. The best evidence for the pro-life theory is that, as the NRLC’s Dave Andrusko points out, the abortion ratio— the percentage of non-miscarried pregnancies that were aborted—declined. That is, the percentage of pregnant women who chose to give birth increased. But this theory has problems. First, the decline in the abortion ratio was only half as big, in percentage terms, as the decline in the abortion rate. In other words, most of the decline in the number of abortions, relative to the overall number of women aged 15–44, was due to a reduction in pregnancies, not to pregnant women choosing life. In fact, the birthrate didn’t increase. It fell by 9 percent. [W]hile most of the new laws [against abortion] were enacted in states in the Midwest and the South, abortion incidence declined in all regions, and the number of clinics fell only in the Northeast and the West. Finally, a number of states that did not enact any new abortion restrictions and that are generally supportive of abortion rights—for example, by allowing state Medicaid funds to pay for abortions for eligible women—experienced declines in their abortion rates comparable to, and sometimes greater than, the national decline. Between 2007 and 2009, the level of nonuse among women younger than 30 decreased from 15% to 12% (a statistically significant change). In addition, substantial shifts in the contraceptive method mix away from less effective methods have been observed, particularly toward uptake of LARC [long-acting, reversible contraception] methods, such as the IUD. In 2002, only 2% of contraceptive users were relying on LARC methods, but this proportion rose to 9% in 2009. If LARC use continued to increase during the study period, this could help explain the national decline in abortion incidence. The report adds that from 2006 to 2010, “LARC use among women accessing publicly funded contraceptive services increased from 4% to 11%.” During this time, “The estimated number of unintended pregnancies averted by federally funded family planning programs increased by 15% over this period (from 1.9 million to 2.2 million).” That’s a big help—and a good reason for everyone to support these programs, not defund them. The legislative efforts of the right-to-life movement, and significantly, the resulting national debate and educational campaigns surrounding pro-life legislation should not be minimized when discussing the decline in abortion numbers. The more Americans learn about the development of the unborn child and the tragedy of abortion, the more they reject abortion as a legitimate answer to an unexpected pregnancy. What’s striking about this argument is how indirect it is. The notion is that by enacting legal restrictions in one state, you’re affecting the moral convictions of women in other states. In philosophy, this concept, in simpler form, is known as legal moralism. It’s the same logic often used to justify drug laws: Even if the laws don’t work well or have serious unintended consequences, we need them to express and promote society’s belief that drug abuse is bad. Legal moralism is losing its grip on this country, and for good reason. People are becoming more sophisticated in their thinking about public policy. They want to know not just whether drugs, guns, or abortions are unsavory or dangerous, but whether the law you’re proposing would actually improve the situation. We have too much bad experience with prohibition. If the strongest argument pro-lifers can make, in terms of their effect on the abortion rate, is that their moral message is persuading individual women, then why not focus more on that and less on legislation? 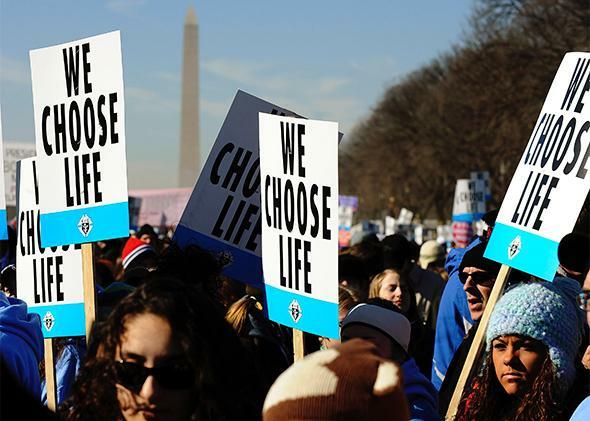 Culturally, most pro-life bills are a waste of time. The NRLC attributes a recent 18 percent decline in abortions in Illinois to the “public discussion” prompted by media coverage of the state’s 1995 law requiring parental notice for a minor’s abortion. Come on. That’s an obvious self-delusion. There’s no need to choose between contraception, choice, and a culture of life. You can use birth control precisely because you don’t want to risk an abortion. You can acknowledge the immorality of abortion, relative to pregnancy prevention, without abandoning the individual as the decision-maker. Together, the cultural message and the technical means can drive down the abortion rate. Everybody wins.